Battle of the brushes - Tangle Teezer vs. Wet Brush! 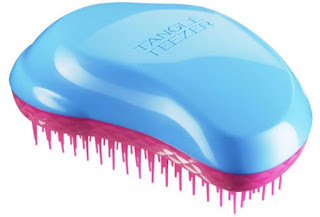 Original Tangle Teezer - $14.99 - in 5 colours: orange and yellow, purple and pink, pink, black and blue and pink - breaks the cycle of broken hair and gives tangled locks the brush off with its ability to flex and not pull upon contact with tangles, gently and effortlessly delivering smooth and shiny hair in an instant. 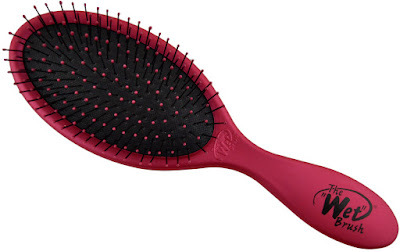 Wet Brush - $15.95 - in 4 colours: purple, pink, black and green - helps you detangle all hair types and textures without pulling, tugging, or tearing - whether it’s wet or dry, curly or straight, thick or fine. It can also be used on hair extensions and wigs! They both sound like they do pretty much the same thing so which one is better? They actually both did a nice job detangling with good and bad points: I prefer the Wet Brush handle, I know the Tangle Teezer is supposed to be more comfortable to hold because of the ergonomic design but my small hands find it hard to grip easily so it might be better for someone with "average" sized hands. On the other hand I liked the bristles on the Tangle Teezer better - they have 2 different lengths so not only do they untangle, you get some nice scalp massage action at the same time - the Wet Brush has soft bristles with poly tips that are twice dipped, I assume so they won't fall off as regular brush tips are prone to do. So I guess what I would really like is a Wet-Teezer hybrid with the bristles of the Tangle Teezer and the handle of the Wet Brush!